These super-fast pickles can be enjoyed immediately, or stored up to two weeks in the refrigerator. The sooner you enjoy them, the crisper they will be. 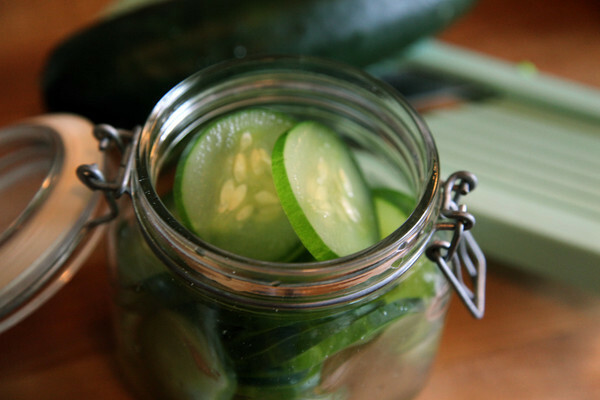 Try using your own favorite brine recipe to create your own signature pickle. Combine all brine ingredients in a large enough sauce pot. Bring to a boil and thoroughly cool in refrigerator. Place sliced cucumbers into 4 vacuum bags and evenly divide cold brine amongst them. Enjoy immediately or store for later. Hello, What pressure setting is this recipe vacuum sealed at? That should have been 1/2 gallon. Correction has been made. Is that 4 cucumbers or should it have been 4 qt. or what?